04/23/09 EVENING AND 669 IS OUT AS WRITTEN! | Vida Preciosa International, Inc.
04/23/09 EVENING AND 669 IS OUT AS WRITTEN! An amazing day that has renewed our faith and lifted our spirit!! A huge thank you to everyone who helped in this endeavor! "WE DID IT FOLKS!!!! Victory over HR669! You can thank yourselves and the Reptile Nation, for a hard fought Victory! Our nearly 50,000 grassroots letters and 1,000s of phone calls to the offices of the subcommittee members clearly prevailed at today's Insular Affairs Subcommittee hearing on HR 669. HR 669 in it's current form is finished. For anything to go forward it MUST be re-written from the ground up....and USARK will have a seat at the table along with other stake holders. Delegate Faleomavega from Samoa said, "The letter and phone campaign hit the subcommittee like a BUZZ SAW". Harry Burroughs, of the subcommittee staff said, "I haven't seen a letter writing campaign like this in 30 years! You should be proud of yourselves." Take heart in the fact that the Reptile Nation stopped HR669 in it's tracks!! We also need to thank Congressman Henry Brown, SC for helping us to focus our fight on the Subcommittee as opposed to the full House of Representatives. He is the one who instructed us to write real letters to be truly effective. He said emails are fine if that is all you can manage, but they can be filtered and deleted. There is no denying the weight of thousands of paper letters from American citizens. The Reptile Nation was responsible for 49,229 letters delivered to the Subcommittee in less than two weeks. Congressman Brown's staff made sure they all got in the door. 38,000 of those letters will be entered into the permanent record. Thank you my friends! Credit should also be given to Bill Martin, a witness who testified at the hearing. He is the President of Blue Ridge Aquatics, a large multi-state Tilapia farming operation. They farm Tilapia as a food fish. He had some serious problems with the bill and the ear of much of the committee. His plain talk of how this bill would destroy hundreds of families hit home. What they do and the impact this bill would have on them parallels the plight of the Reptile Nation. Senior Democrat staff from the House Committee on Natural Resources advised Subcommittee Chair Madeleine Bordallo that if she wants something to go forward she will have to go back to square one and draft a new bill. Then have another subcommittee hearing. When and if she does, USARK will be there to represent the interests of the Reptile Nation!! They probably will try, and that will be our challenge for another day. But Today VICTORY is SWEET!...... Celebrate today and rest, because tomorrow we must get ready to fight again. Thank you Reptile Nation! Thank you Tom Wolfe. Thank you everyone who did their part. Stay tuned... This fight has only begun!" "The good news is, USARK engineered a significant victory which caught the attention of the entire membership of the Subcommittee and their staffs. The bad news is this is just the first step in the process. Members of the Reptile Nation should be jubilant with this victory. However, our success should be measured, because the proponents of HR 669 will be back soon with another version of the same legislation. They will not rest, so we must not rest either. Take satisfaction in a job well done and a victory well deserved, but know we all must rise up again to fight on because the battle has just begun!" 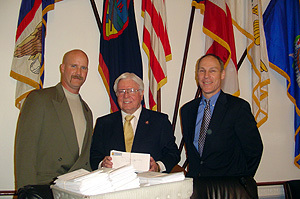 ( pic above ) - USARK President, Andrew Wyatt presents Republican Staff Director Harry Burroughs the 38,000 letters that were admitted into the record of the official proceedings of the Insular Affairs, Oceans & Wildlife Subcommittee hearing on Thursday, April 23, 2009. ( pic above ) - Partial view of the 14 boxes and 11 USPS mail bins containing the 38,000 letters delivered to the Insular Affairs, Oceans & Wildlife Subcommittee. 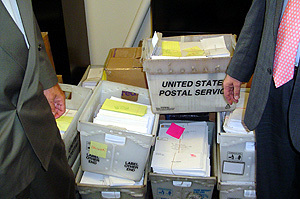 ( pic above ) - Insular Affairs, Oceans & Wildlife Subcommittee Ranking Republican Henry Brown, (SC-1) accepts one of the 25 containers comprising of over 38,000 letters from THE REPTILE NATION delivered to the subcommittee hearing on April 23, 2009. Left to right, Andrew Wyatt - President USARK, Congressman Henry Brown and Tom Wolfe - Washington representative for USARK.